It was a snowy afternoon on Dec. 26, when six School of Nursing students and two professors embarked on a GEL trip to the diverse locale of Tanzania. The first few days were spent in Arusha, one of Tanzania’s more developed towns. 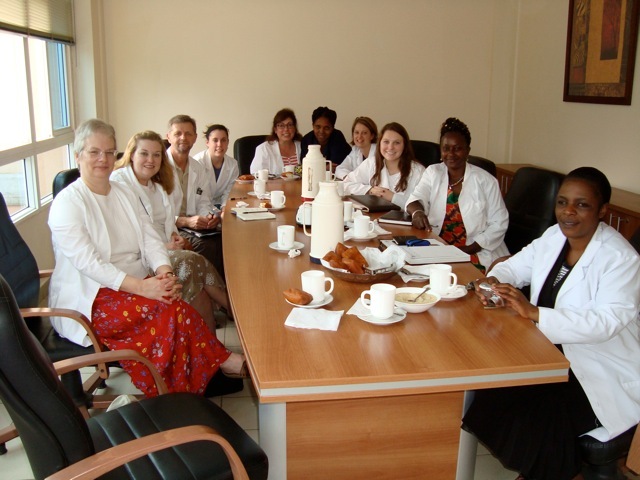 The group had the opportunity to visit Arusha Lutheran Medical Center and Selian Lutheran hospital. This first insight into Tanzania’s healthcare delivery system opened our eyes to the lack of medical resources that exist there. Similar to the United States, there is a nursing and physician shortage, but on a much larger scale. There are very few nursing and medical schools, which are extremely expensive. The average Tanzanian makes about $3.00 a day. We departed Arusha and the beauty of Mt. Kilimanjaro’s snow-capped summit to set our sights on several safari adventures. We made our way through the sundry landscape of Arusha National Park, the ethereal blue-green vistas of Ngorongoro Crater and the vast wildlife-filled expanses of the Serengeti. Our journey through all of these natural environments was exhilarating as we were amazed by elephants, giraffes, monkeys, lions, leopards and so many more animals in their true environment, without bars, glass enclosures or high fences. Our journey soon found us farther north, near the small town of Tarime, to spend our last week at Teamwork City of Hope. The facility consisted of an orphanage of 100 children ranging between the ages of 5 to 18; a primary as well as secondary school, which enrolls an additional 300 children; and finally, a medical center. The medical center, constructed just a couple of years ago, still, does not have running water or electricity. However, we were amazed at the resourcefulness of the lab technician, known as Dr. Ben, and the two nurses who manage the facility. They would perform assessments, obtain blood and urine samples, and use the only microscope available to them. It was placed in a window with mirrors to utilize the natural light and enhance their ability to look at specimens. As nursing students we were given the opportunity to observe and help as much as possible, given our short stay. We left knowing that their lack of medical resources continues to make dealing with illness a primary survival focus. There was so much knowledge to be gained from participating in this Tanzania GEL program; learning about the healthcare system, delving into the cultural diversity of the Hadzabe bushmen, Datoga tribe and the Maasai warriors, greeting the villagers of Tanzania, and most importantly, teaching the children at the City of Hope. We held a small health fair where the children were taught the importance of washing their hands, listened to their heartbeats, and participated in arts and crafts. Wherever we were within the country, the common thread was the warmth and politeness of the people, as well as the beauty of their culture. As American strangers in a different but captivating environment, the Swahili words jambo (hello) and karibu (welcome) were constantly heard as we ventured through the many villages. We returned home with many memories, but most importantly for the smiling faces of the precious children, Tanzania’s promise for a brighter future.